This is Mr Mckay. He's a new visitor to our garden, a beautiful woodpigeon and we've named him Mr Mackay because he does a funny head twitch like Fulton Mckay did in the tv show Porridge! I find myself completely inspired by the greeny-grey colour of his feathers and the elegant shape of his head and beak, so i started googling for pigeon art and colours and i came up with a quite a few! I found myself falling for the charms of Lovely Pigeon, a Scottish designer who produces brooches, prints and cards with pigeon images. I treated myself to one of her brooches, and it was only £4, so a bit of a bargain! I'm very taken with the prints she has done too, but am finding myself running out of room and money for more artwork. Maybe i'll ask for one for Mothers Day. 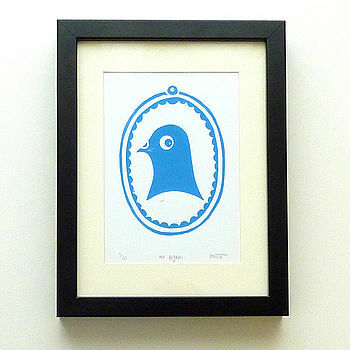 This is my favourite, Mr Pigeon, and it comes in different colours too, and now has a Mrs Pigeon print to go with it! They are all available from Not On The High Street, http://www.notonthehighstreet.com/. It's worth checking out the blog too http://www.lovelypigeon.blogspot.com/. I'm now swithering with painting the living room with Farrow and Ball's Pigeon. But that's maybe going too far!